The Estonian city Tallinn is way ahead of the rest of the world: in 2013 it will be the first capital city with free public transport. Looking at the crazy traffic in Bangkok, you would not possibly think about getting a bike. There are so many ways to protest and initiate change. Since there is no greener thing than plants, let us have a look at how rebellious gardening can be. Buenos Aires is getting on its saddles. Bicycles are slowly starting to be a real transport alternative in the city of 12,000,000. 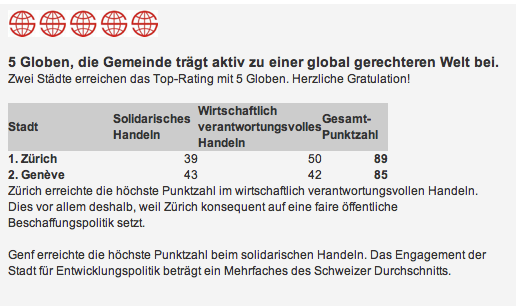 Solidar, a Swiss organisation for a more just and equal world, has made a rating of the biggest Swiss cities about their global responsibility.